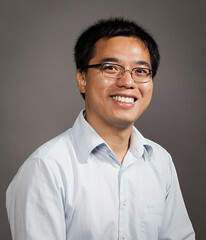 Yuebing Zheng is an assistant professor of Mechanical Engineering and Materials Science & Engineering at the University of Texas at Austin. He received his Ph.D. in Engineering Science and Mechanics (with Prof. Tony Jun Huang) from The Pennsylvania State University in 2010. He was a postdoctoral researcher (with Prof. Paul S. Weiss) at the University of California, Los Angeles from 2010 to 2013. His research group engage in interdisciplinary research to innovate optical nanotechnologies in health, life sciences, national security, energy, and manufacturing. Their mission is to (1) advance fundamental understanding and control of light-matter interactions at the nanoscale, (2) develop and apply optically active materials, devices and tools, (3) promote interdisciplinary trainings for students to understand and contribute to the multiple fields of engineering, science, and medicine. They have been awarded the 2017 NIH Director’s New Innovator Award, the 2017 NASA Early Career Faculty Award, the 2017 ONR Young Investigator Award, and the 2014 Beckman Young Investigator Award. L. Lin, M. Wang, X. Peng, E. N. Lissek, Z. Mao, L. Scarabelli, E. Adkins, S. Coskun, H. E. Unalan, B. A. Korgel, L. M. Liz-Marzán, E. L. Florin, and Y. B. Zheng, “Opto-Thermoelectric Nanotweezers,” Nature Photonics (2018) DOI: 10.1038/s41566-018-0134-3. B. B. Rajeeva, Z. Wu, A. Briggs, P. Acharya, B. S. Walker, X. Peng, V. Bahadur, S. R. Bank, and Y. B. Zheng, ““Point-and-Shoot” Synthesis of Metallic Ring Arrays and Surface-Enhanced Optical Spectroscopy,” Advanced Optical Materials (2018) DOI: 10.1002/adom.201701213. Z. Wu and Y. B. Zheng, “Moiré Metamaterials and Metasurfaces,” Advanced Optical Materials 6 (2018) 1701057. Featured as Inside Cover Article. L. Lin, J. Zhang, X. Peng, Z. Wu, A. C. H. Coughlan, Z. Mao, M. A. Bevan, and Y. B. Zheng, “Opto-Thermophoretic Assembly of Colloidal Matter,” Science Advances 3 (2017) e1700458. L. Lin, X. Peng, Z. Mao, X. Wei, C. Xie, and Y. B. Zheng, “Interfacial-Entropy-Driven Thermophoretic Tweezers,” Lab on a Chip 17 (2017) 3061-3070. M. Wang, G. Hartmann, Z. Wu, L. Scarabelli, B. B. Rajeeva, L. Liz-Marzan, G. S. Hwang, and Y. B. Zheng, “Controlling Plasmon-Enhanced Fluorescence via Intersystem Crossing in Photoswitchable Molecules,” Small (2017) 1701763. Featured as Frontispiece Article. L. Lin, X. Peng, and Y. B. Zheng, “Reconfigurable Opto-Thermoelectric Printing of Colloidal Particles,” Chemical Communications 53 (2017) 7375-7360. Z. Wu and Y. B. Zheng, “Moiré Chiral Metamaterials,” Advanced Optical Materials 5 (2017) 1700034. Featured as Inside Front Cover Article. L. Lin, X. Peng, X. Wei, Z. Mao, C. Xie, and Y. B. Zheng, “Thermophoretic Tweezers for Low-Power and Versatile Manipulation of Biological Cells,” ACS Nano 11 (2017) 3147-3154. L. Lin, M. Wang, X. Wei, X. Peng, C. Xie, and Y. B. Zheng, “Photoswitchable Rabi Splitting in Hybrid Plasmon-Waveguide Modes,” Nano Letters 16 (2016) 7655-7663.